The Marlins tagged Dodgers’ starter Julio Urías for seven runs over just 2.1 innings as they got revenge for Friday night, beating the Dodgers 10-6. Urías was struggling from the first pitch he threw when Dee Gordon singled to lead off the game. 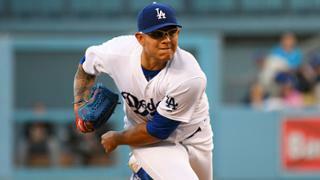 Urías threw 71 pitches and only 43 for strikes, giving him a strike percentage of 61. Giancarlo Stanton contributed with three hits, three RBIs, and a run scored, helping the Marlins to snap their five-game losing streak. J.T. Riddle went 3-5 with four RBIs and two runs scored, including a home run. Dan Straily held the Dodgers hitless through 4.2 innings, before Kiké Hernández hit a solo home run, sparking the Dodgers to attempt a comeback, that ultimately fell short by four runs. While Urías was unable to hit the target that Yasmani Grandal gave him, Straily was hitting the target that J.T. Realmuto showed him. This was the difference between walks and hard hit balls, and strikeouts and groundouts. In the first inning, after Gordon singled to lead off, Christian Yelich and Marcell Ozuna walked to load the bases. Stanton then hit a bouncing ball to Corey Seager, who wisely threw to second for the out. The relay was not in time and Stanton got an RBI, giving the Marlins a 1-0 lead. Justin Bour then grounded into a double play, getting Urías out of the inning with only one run allowed. In the second, Urías induced a groundout, then gave up a triple to Derek Dietrich. With the Dodgers’ infield drawn in, Urías missed down and away, but Riddle managed to get his bat on the ball and it rolled into left field. Dietrich scored and the Marlins had a 2-0 lead. After a sacrifice bunt, Gordon hit a ball softly into center field and Dietrich scored, giving the Marlins a 3-0 lead. Gordon then stole second base before he was stranded there. In the third, Ozuna reached on an error, then advanced to second on a balk by Urías. Urías then missed his spot to Stanton, who made him pay by driving the ball to right field for an RBI double, giving the Marlins a 4-0 lead. Bour then singled to right center field and Stanton scored. Joc Pederson was unable to pick up the ball and Bour took second on the error. After Urías issued another walk to load the bases, Grandal asked for a changeup down to Riddle. Urías threw it way to high and Riddle drove it down the right field line for a two-run double. In the fourth, Yelich walked with one out, then Ozuna singled, putting runners on first and second. Stanton then took advantage of Luis Avilan, who missed his target. Stanton drove the ball to left field and the Marlins took an 8-0 lead. With two outs, Realmuto hit the ball into right field when Josh Fields missed his target. Ozuna scored and the Marlins had a 9-0 lead. In the fifth inning, Fields hit his target, but Riddle still was able to drive the ball over the wall in right-center field for a solo home run. The Marlins took a 10-0 lead on the homer and it was hard to believe that the game started out tied at zero. In the bottom of the inning, Hernández followed Riddle’s homer with a solo shot, recording the first hit for the Dodgers and getting them on the board. In the sixth, Grandal hit an RBI double and Cody Bellinger scored on a wild pitch, cutting the Marlins lead to 10-3. The wild pitch went behind Pederson, but it did not seem intentional since the bases were loaded. In the seventh, Seager came to the plate with a runner on and hit a two-run home run over the left-center field wall. Bellinger then followed with a solo home run, going back-to-back with Seager and cutting the Marlins lead to 10-6. If you didn’t notice it, I encourage you to look back at the article and see how many times I said that the Dodgers’ pitchers missed the target that Yasmani Grandal gave them. When a pitcher misses the target the his catcher gives him, it makes it that much easier for the batter to hit it. When the catcher asks for the ball in the dirt and the pitcher throws it even around the batter’s knees, it gives the batter a much better chance of hitting a home run. Vance Worley will make his Marlins debut on the mound and Brandon McCarthy will pitch for the Dodgers in an attempt to win the series. Worley will be making his first Major League start since last September. McCarthy will try to rebound from his last start when he allowed six earned runs in a loss to the Giants. The game will start at 1:10 pm PT and be televised on SportsNet LA and KTLA.